Summary: CROW will purchase an endoscope and related equipment for the treatment of sea turtles. Endoscopy is a vital diagnostic tool in the treatment of sea turtles as it is minimally invasive and offers several benefits over other diagnostic options. One important benefit is that when an obstruction or lesion is observed, biopsies can be taken under direct visual control. 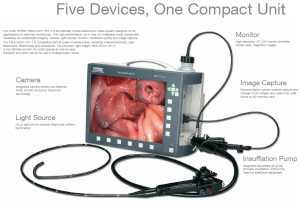 The identification of internal lesions through endoscopy allows for more accurate prognosis. Additionally, the endoscope package will also allow CROW to harvest tissue samples, retrieve foreign bodies, perform remote aspirations, and administer drugs. The ability to perform endoscopy procedures will enable quicker diagnosis and shorter recovery for many of CROW’s sea turtle patients. Results: CROW received funding from the Sea Turtle Conservancy for the purchase ofa Tele Pack Vet X endoscope for diagnosis and treatment of sea turtles. The equipment was acquired in November 2014. In 2014,33 sea turtles were treated at CRaW's wildlife hospital. To date in 2015, the hospital has seen 7 sea turtles. Since its arrival at CROW in November, the endoscope has been used to: remove hooks from sea turtle GI tracts, assess coeloms, perform oral exams, and look for internal fibropapillomas. The ability to utilize the endoscope in-house for diagnostic and treatment activities for sea turtles has resulted in significant savings. In addition, it allows CROW to keep sea turtle patients on-site thus avoiding stressful transportation for off-site diagnosis and treatment.